We’re continuing our series of ‘Brand Spotlights’ with the incomparable Dubarry of Ireland. From humble beginnings in Ballinasloe, Galway, Dubarry has become renowned worldwide for quality leather men’s shoes thanks to their reputation for excellent workmanship and quality. Read on to find out more about your new favourite brand. Dubarry takes their name from the famous French courtesan, Madame Dubarry, lover to the French King Louis XV. Madame Dubarry was a seamstress renowned for her beauty. Dubarry took on the name to reflect the European, continental flavour of the brand. Dubarry draws inspiration from the dramatic landscape and extensive sailing heritage of Galway, providing superb deck shoes and boots that are as at home on land as at sea. 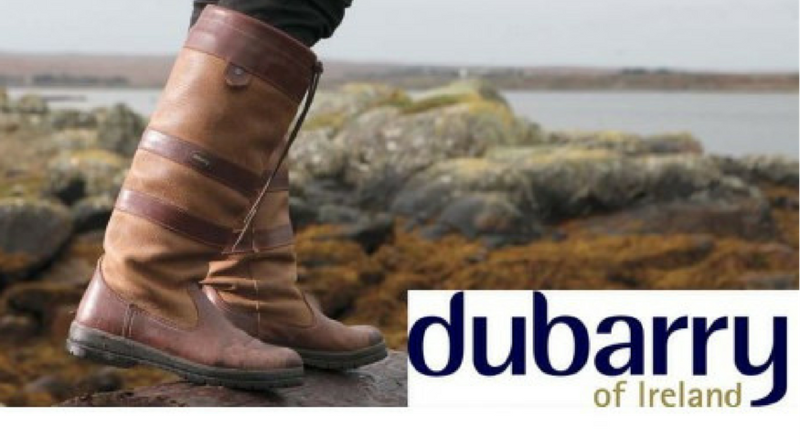 Dubarry use the finest materials possible, and over the years, they have developed an international sourcing network, working closely with carefully selected partners who share a desire to work with the best of raw components. However; Dubarry has never lost sight of the company’s heritage, of which they are extremely proud. Dubarry footwear and clothing are admired and worn worldwide, but they continually look to their homeland and its people for inspiration. Dubarry have a wide range of shoes, boots and clothing available, but without doubt, their boots and deck shoes steal the show. Renowned for their quality, Dubarry’s boat shoes feature durable, non-slip soles, perfect for hitting the deck, and comfortable padding for all-day long wear. They also feature a rolltop hand stitching seam to keep the water out. There is a wide range of boat shoes available, and with many colours available, there’s one to suit all tastes. Robinson’s shoes also stock two different Dubarry boots, the Dubarry Ultima and the Dubarry Crosshaven. Tough, water resistant and fully breathable, they’re a must for any outdoor adventurer or seafarer. With so many styles to pick from with Dubarry, you really are spoilt for choice. However, we’re huge fans of the Dubarry Corsica, a brand new men’s boat shoe style for SS17. Available in a classic French Navy suede, they’re a classy alternative to sandals this summer, and would look perfect paired with jeans or shorts. It’s also hard to beat a classic boat shoe, and the Dubarry Admirals fit the bill perfectly in this beautiful brown leather finish. The boat shoe is sure to stay in fashion for many years to come, and the durable leather of Dubarry’s shoes ensures they’re a great investment in style. Are you tempted yet? At Robinson’s Shoes, we stock a wide range of Dubarry shoes, both in store and on our website, and with free delivery on orders over £150 there’s nothing stopping you from adding a pair or two to your basket. If you prefer the personal touch, why not call into our Carrickfergus store today, and take a look at our excellent selection of Dubarry shoes? We’ll also measure your feet and ensure you’re wearing the right size of shoe, so you can find your perfect pair this summer!